Design West Landscaping is a premier landscape design and installation company providing customized services to businesses and homes across the East Bay and Northern San Joaquin Valley area. We consider it a matter of pride that a large number of residential property owners in and around Lodi, Stockton, and Elk Grove turn to us for all their outdoor features requirements. Many homes in Galt, Dublin, and Lone sport our unique patios and most clients also request us to install patio covers for them. While the patio is a great place to relax or entertain friends in, the weather can sometimes prove to be a deterrent. The one way to better use your patio is to get a custom patio cover or shade structure installed above it. Not only will this make the patio usable when it’s sunny, but will also add dimension and beauty to the space. Many commercial establishments like restaurants, clubs, and cafes in Lockeford, Tracy, and Woodbridge with open-air seating areas have benefited from getting a patio cover installed on their properties. We can design and install a complete patio shade structure or a partial one based on your specific needs. 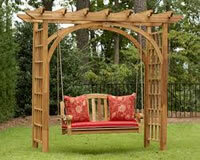 Wooden pergolas are a great addition to any patio and you can grow climbing plants on it. Alternatively, you can get shade sails installed or even a retractable cover to provide complete shade when you need it. You can get a pergola installed in any area of your yard and it can be either a standalone feature or attached to the exterior walls of your home or even a poolhouse. We have also built pergolas on poolscapes and they provide the partial shade needed on tanning ledges and decks too. These features have a very simple and linear design, but instantly uplift the appearance of the yard. Since we will custom design this feature for, you can choose the size, material, and style to suit your preferences and ideas. Yard features like pergolas need to be built using weather-resistant materials as they are exposed to the elements. It’s why we choose high-grade solid wood, vinyl or aluminum in our work. The actual pergola installation will be handled by skilled craftsmen, so you can rest assured that the feature will be stunning and resilient. When you will settle for nothing but the best, the only company you need to approach is Design West Landscaping. Whether you want a pergola as part of a larger landscaping project or want to add one to your existing yard, we can provide the solutions you need. For any more information, pergola cost-related queries or to discuss your project details, feel free to call us at 209-327-9661 or send us your requirements via this Contact Us form.